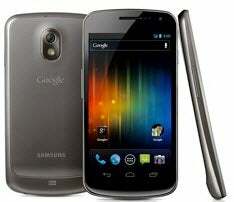 Google and Samsung on Tuesday unveiled the Galaxy Nexus phone running Ice Cream Sandwich, the latest version of Android. The phone and operating system were developed collaboratively by engineers from both companies that literally worked in the same building, said Andy Rubin, senior vice president of mobile at Google, speaking during a webcast event to launch the phone and operating system in Hong Kong. The name of the device combines that of Samsung's line of Galaxy phones and tablets with the Nexus line of phones that were made by various manufacturers but were known as Google phones because they included all of Google's mobile services. The phone will run on high speed LTE networks as well as HSPA+ networks, depending on market demand. It will become available in November in the U.S., Europe, and Asia, including China and Japan. Japan's NTT DoCoMo is the only operator the companies announced and they did not disclose pricing information. While Ice Cream Sandwich was designed to unite the tablet and phone versions of Android into one operating system, there was no mention of tablets during the event. Honeycomb, the previous version of Android which has yet to be released as open source, was designed just for tablets. Ice Cream Sandwich has some updates that appear relatively minor, but Google has added some neat features to some of its services, many of them reminiscent of features on other mobile operating systems. One of the most noticeable changes to the operating system is that it requires no physical buttons. The Galaxy Nexus only uses buttons that appear on the screen as part of the user interface. The user interface now includes a new swipe feature that lets users drag applications or items off the screen to shut them down or delete them. It also features a new font that Google developed for Android, called Roboto. Most of Google's applications are updated for the new operating system. The browser will let users opt to view the full web site instead of the mobile version by clicking on a drop down menu item. The browser also lets users save pages for offline reading. That feature can come in handy for people who might want to save a boarding pass, concert tickets or train schedules, said Hugo Barra, Google's product management director for Android. Gmail gets a number of updates, including featuring two lines of a message in the preview page, new action options at the bottom of pages, and offline search. Gmail will automatically search the past 30 days of emails but users can set that time period for anything they like, Barra said. The calendar app has also been updated so that pinching and zooming on a list of appointments for a day displays more details of each appointment. Ice Cream Sandwich includes a very useful new tool for managing data usage that some operators might not like. The data usage application shows a chart of data usage for the current billing period. Users can set a threshold after which the application will either notify them or cut off access to data, depending on the user's preference. Users can decide to prevent applications from using any data while running in the background so that the applications are only active while in use. Ice Cream Sandwich also has a number of neat additions to the camera application. The camera has zero shutter lag--it takes a photo the instant the user hits the capture button. A new panorama feature lets a user take a panorama shot simply by slowly panning the camera across a scene. The application stitches the photos together. The software also features a new People app that is reminiscent of the similar Windows Phone application. Barra called it a "magazine style UI" that features large blocks of photos, much like Windows Phone's Metro tiles. Tapping on a contact in the People app displays a large photo of the person, all the contact information and all the ways a user is linked to the person, such as via LinkedIn and Twitter. Users will be able to add individual people to the phone's home screen for easy access, like Windows Phone users can. Ice Cream Sandwich uses Near Field Communications in a new way in an application called Android Beam. Galaxy Nexus users will be able to tap their phones against another phone to share web pages, maps, YouTube videos and even games. Users will be able to create folders of applications on their home screens in a similar way that iPhone users make folders. By dragging one application onto another, the user creates a new folder. A new screen shot capability lets users hold down the power and volume buttons at the same time to capture a photo of the current phone screen. Ice Cream Sandwich also now includes facial recognition technology that allows a user of the Galaxy Nexus to look into the phone's camera to unlock it, rather than typing in a code to pass the lock screen. In a demonstration at the event, the technology failed to recognize Matias Duarte, senior director of Android user experience who showed off the new operating system. The phone features a 1.2 GHz dual-core processor and a large, 4.65 inch Samsung HD Super Amoled display with 1280 pixels by 720 pixels resolution. The Galaxy Nexus has an unusually small bezel--or the space between the edge of the screen and the edge of the phone--which means it's still comfortable in your pocket despite the large screen size, said Kevin Packingham, senior vice president of product innovation for Samsung. "We made the screen wider but it won't feel bigger in your hand," he said. The Nexus S, an earlier model produced by Samsung, also featured a slightly curved face. It's a unique feature on a smartphone. While Android is the number one smartphone operating system, Apple's iOS still holds mind share and new iterations of Android often appear to attempt to one-up the iPhone. Apple began selling the iPhone 4S on Friday and said it sold 4 million in the first three days, more than double the sales of the iPhone 4. Samsung and Google initially planned to introduce the phone and new software last week during the CTIA conference in San Diego. But at the last minute they cancelled the event, saying it wasn't the right time to introduce a new phone so close to the death of Apple founder Steve Jobs, who passed away the previous week.